This is excerpt No. 10 (of 45) from America’s Right Turn: How Conservatives Used New and Alternative Media to Take Power, by Richard A. Viguerie and David Franke. In our last article we saw how William F. Buckley Jr. gave intellectual voice to the new conservative movement, and his magazine National Review gave the new movement its journalistic voice. But conservatives also needed a political voice if they were to go to combat in the political arena. That political voice came from an outspoken U.S. Senator from Arizona, Barry Goldwater. Goldwater went where no other Republican leader dared to go—he voiced open criticism of President Eisenhower, calling Ike’s policies a “dime-store New Deal.” Rebellion against the “modern [i.e., liberal] Republicans” was in the air, but Goldwater and his supporters knew it would be a mistake to challenge the heir apparent to Eisenhower, Vice President Richard Nixon, at the 1960 GOP convention in Chicago (they didn’t have the troops yet). So they worked out a strategy that brought Goldwater to a national television audience for the first time. And they did, with amazing results. To backtrack a bit, by 1959 the young people were embarrassing the older Americans for freedom (or OAFs) by their activism, so the grown-ups decided to get organized too. As with the younger conservatives, their attention was centered on Arizona’s Senator Barry Goldwater. In the period between 1955 and 1960, Goldwater emerged as the leading conservative spokesman pretty much by default – no other politician on the Right was willing to stick out his neck and attack the Eisenhower administration. Goldwater did, accusing the “modern” Republicans of “fiscal irresponsibility” equal to that of the Democrats. People on the Right were looking for a successor to Robert Taft, and they found one in Barry Goldwater. Facing re-election in 1958, Goldwater succeeded in changing Arizona from a Democratic state to a Republican state (a harbinger of the GOP’s Sunbelt strategy to come). His victory stood out against the general GOP carnage that year, which included the defeat of Senate Minority Leader Bill Knowland in California. While not the best manipulator of words, Goldwater had other qualities, in addition to political courage, to endear him to the conservatives. He was handsome and personable, important considerations in the coming television age. He was an honest, no-nonsense Westerner in every good sense of the word, offering a full contrast to the regal patricians, like Nelson Rockefeller, who dominated the Republican Party on the East Coast. And coming from a half-Jewish heritage, Goldwater put a lie to the persistent liberal slanders about the Right being anti-Semitic. This country, and its majesty, is too great for any man, be he conservative or liberal, to stay home and not work just because he doesn’t agree. Let’s grow up, conservatives! We want to take this party back, and I think someday we can. Let’s get to work! 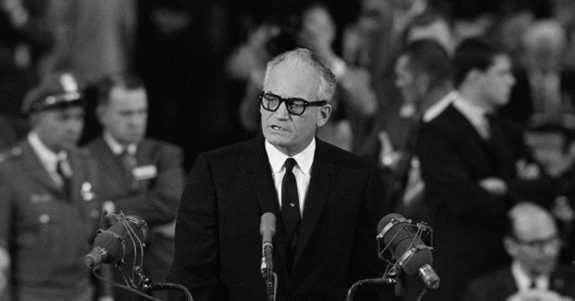 That dramatic speech brought Goldwater to the attention of the American people over network television for the first time. His demeanor on the podium won the movement countless new recruits, and Goldwater’s new book, Conscience of a Conservative, won still more recruits. It sold 100,000 copies in the hardcover edition published by Victor Publishing in Shepherdsville, Kentucky – not exactly a mainstream publisher – and has since sold more than 3,500,000 copies in both hardback and paperback. (It’s still in print!) The conservative movement was now operating with a much higher profile than could have been foreseen even a year of two earlier. Taking their cue from their leader, conservatives grudgingly worked to elect Nixon, only to be defeated by Kennedy’s theft of the election in Illinois. Then they got to work to take over the GOP. In that 1960 election year, Americans for Constitutional Action released its “ACA Index,” the first scorecard rating members of Congress ever compiled by a conservative organization. Now conservatives had a precise way of knowing which Republicans to support or oppose, based on their voting record, and they used these ratings to help change the face of the GOP. Outside of the National Review orbit, Robert Welch had formed the John Birch Society in 1958. In the following few years it became arguably the largest grassroots organization in the conservative movement, with some 60,000 active members in hundreds of chapters and operating dozens of bookstores. The society was strongest in California and Texas, two states that became increasingly critical to the fortunes of the new conservative movement. By the beginning of the Sixties it was obvious that a new movement – conscious of itself as a movement – had indeed emerged. Barry Goldwater was its political spokesman, National Review and Human Events were its principal organs, and the first major goal had been set: to take control of the Republican Party. Extending National Review’s orbit of influence, L. Brent Bozell, Buckley’s Yale roommate and brother-in-law and a National Review editor, had been the ghostwriter for Barry Goldwater’s phenomenally successful Conscience of a Conservative. Bill Rusher, National Review’s publisher, was a key player in all the politicking to turn the Young Republicans in a conservative direction and, later, to draft Goldwater in 1964. And in 1962, Dan Mahoney and Kieran O’Doherty – friends of Buckley’s and Rusher’s – started the New York Conservative Party with National Review’s blessing, thereafter changing the dynamics and direction of politics in Rockefeller’s back yard. In Washington, meanwhile, Human Events had changed from a newsletter to a tabloid, and in response to National Review’s leadership role, Human Events itself became more activist. Its pages soon were filled with much broader coverage of conservative activism than you’d find in National Review, and in 1961 Human Events hosted its first of three conservative political action conferences in Washington, D.C. These were the forerunners to the Conservative Political Action Conferences (CPACs) held annually from 1973 to this day. In less than a decade, conservative activists had come a long way – from a state of non-existence as a movement, to making a publicity breakthrough in Chicago in 1960, to filling Madison Square Garden in 1962 and creating a veritable grassroots army of conservatives throughout the United States. But the fun was just beginning. To order American's Right Turn from Amazon please click this link.